Homer, Texas AKA Angelina, Texas. 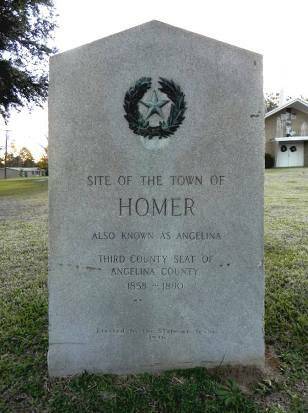 Homer became the Angelina County Seat in 1858 after defeating Jonesville in a contested election. 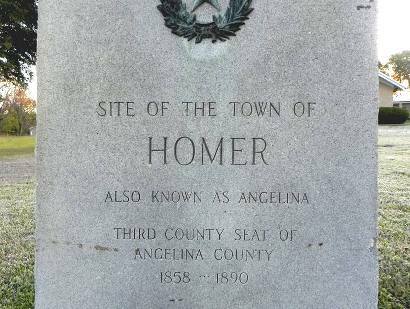 Homer’s name was changed to Angelina at this time, but the name didn’t gain favor and it was officially changed back to Homer in 1862. Marion, Texas (being the first Angelina County seat) had retained the county’s first (log) courthouse. Since Jonesville never built one, the courthouse was dismantled and moved to Homer where it was used until it was replaced by a two-story frame building in 1873. 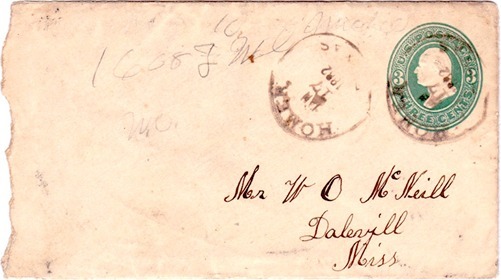 Homer became the county’s most important town – with only Lufkin as a near rival. 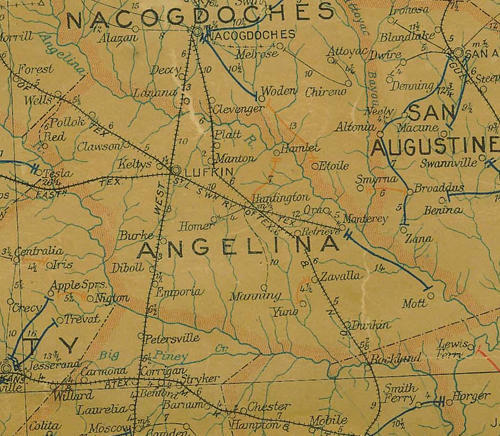 The tables were turned in the early 1880s when the Houston, East and West Texas Railroad bypassed Homer in favor of the more direct path through Lufkin. Homer, even at its high-water mark never had more than 500 residents but the bypassing didn’t cause it to wither. It retained the courthouse and a population in the 300s through the rest of the 1880s. In late 1891, Homer’s courthouse burned. The more prosperous city of Lufkin became county seat the following year. This official shift did cost Homer its population. By 1904 the population was down to 166 people and ten years later it was a mere 75. It increased in the 20s to just over a hundred. It received a shot in the arm in the 1960s and was incorporated in 1971. The population had increased to 360 by the 1990s – with that figure given to the 2000 Census.